The Almost No Knead Bread was what I made awhile back. This time around I incorporated some additional flavor with the use of Parmesan cheese and dried herbs (oregano and thyme.) 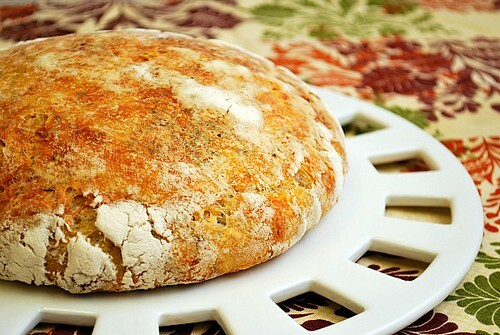 I must say that it's just as easy to impart some flavor but still is a great bread without. This bread does require some patience though, so don't plan on having bread the same day you make it. If anything, allowing enough time for this bread to proof and rise is the most challenging... but your patience is definitely worth it. What makes this recipe so easy? Well, it entails combining bread flour, yeast, salt and warm water. You can then add your choice of cheeses and dried herbs. Mix it up and let it rest... for 12-20 hours. After that, the dough is shaped and allowed to rest for another 2 hours. The last leg of the process is just firing up the oven and baking for 30 minutes. So tackle that yeast and get to baking! Combine all the above ingredients in a large bowl. The dough will be shaggy and messy, which is exactly what you want. Leave the dough in the bowl and cover with plastic wrap. Keep on your counter for 12-20 hours. The dough will now be wet, sticky and bubbly. With a wet spatula, dump the dough on a floured surface. Wet your hands and form the dough into a ball shape. Generously dust a cotton kitchen towel with flour. Set dough seam side down on top of towel. Fold towel over the dough. Let it nap for 2 hours. When you have 30 minutes left for your dough to nap, place a five-quart dutch oven into your oven and preheat to 450 degrees for 30 minutes. After your oven has preheated for 30 minutes, the dough should have doubled in size. Remove the pot from oven. Holding the kitchen towel your dough was sitting on, turn over and dump the dough into pot. Shake the pot to even the dough out. Cover and bake the bread for 30 minutes. Uncover the bread and bake for another 15-20 minutes or until the crust is beautifully golden and middle of loaf is 210F. Remove the bread from the pot and let it cool on a wired rack. I like the idea of no kneading. I'll definitely be giving this one a go. Garlic and rosemary sounds like a good combo. I love it... and that pic... oh yeeees! This bread looks absolutely perfect. I also like the idea of no kneading Bookmarked! This sounds so good, Joelen. The no kneading part makes it even better. I love the idea of parmesan & herbs !! this is great !! I've been wanting to try this but my dutch oven is not coated (like a le creuset). Do you think this would cause an odd reaction with the bread? @Sarah - Good news, as long as it's seasoned properly, you can use your uncoated cast iron dutch oven! "and middle of loaf is 210F." Where is parmesan pull apart bread? Ibrahim - Insert an instant-read thermometer through the side of the loaf and the internal temperature should be 190 to 210 degrees... OR, you can tap it and when you hear a hollow sound, the bread is done. Anonymous - I'm not sure I have a recipe for Parmesan pull apart bread, but it sounds delicious and I may have to bake that up soon!